POSCO Daewoo operates in Indonesia since 2007, through its subsidiary PT BIA. Between 2012 and 2017, PT BIA destroyed 26,500 ha of forest in connection to its concession, and has been met by resistance both locally and abroad. POSCO Daewoo, describing itself as Korea's biggest trading company, operates in the province of Papua though its subsidiary PT Bio Inti Agrindo (PT BIA), in which it has an 85% stake. Since 2007, PT BIA holds a palm oil concession located in Merauke Regency, which is divided into an eastern and western block, comprised by 6,800 and 29,400 ha respectively (1, 2). The company also administers a mill in the area, which was put into operation in 2017 (3). PT BIA's concession is located in Indonesia's largest intact rainforest, an ecoregion known for its extremely diverse flora and fauna. It is home to a number of endangered species such as the tree kangaroo and birds of paradise (4, 5). A social and environmental impact assessment was conducted in 2009 as part of the company's operation permit application at the National Government. It listed several potential detrimental impacts of PT BIA's operations on the surrounding environment and communities. Those included for instance river pollution, decreased water quality, soil erosion and disturbance of the habitats of protected species. Despite this, the company was granted the permit. Tragically, the potential impacts listed have all been seen in the area since the assessment was made (5). PT BIA was responsible for destroying 26,500 ha of forest in connection to its plantations between 2012 and 2017, which could be proven through thorough satellite mapping (6, 3, 13). The clearing of its western block begun in 2012 and finished in 2014. It is now fully converted into oil palm plantations, while the eastern block is only partly deforested (3). Satellite imagery has also shown an unusually large hotspot frequency and distribution within the concession (3, 4, 6). Moreover, notably, the concession of PT BIA is bordering that of Korindo Group PT, another company similarly accused of deforestation and forest destruction. It has been speculated that the remaining 15% of the shares in PT BIA are owned by Korindo (1). The investment of PT BIA in Meruke Regency is located within the bigger Merauke Integrated Food and Energy Estate (MIFEE), a mega-project endorsed by President Jokowi focused on industry, palm oil and food crops in the regency (7). Upon arrival to the area, PT BIA did allegedly pay the local population 50,000 rupiah (USD 3.5) per hectare of land surrendered to the company. However, the community members were not informed of the fact that the company would later apply for and obtain a commercial use permit (HGU) from the national government over the land. An HGU permit is valid for 35 years, and after its expiration the land returns to the state, and not to the local population. As such, the communities lost their rights to the land as PT BIA obtained its HGU permit (8). In response to this, protests were seen in Jayapura in 2012. The same year, a blockade of the PT BIA plantation was organised in Kampung Selil (7). Several indigenous communities in the area have mobilised, supported by for instance Malind Bian Customary People’s Association (LMA). For instance, in 2013, a meeting was held between the customary councils of Mbian and Mandobo tribes, the local police chiefs, the District Head and local military representatives, which resulted in compensation being paid to the indigenous groups (9). In 2015, Norwegian Government Pension Fund Global (GPFG), the largest sovereign wealth fund globally, announced a withdrawal of its investments in POSCO Daewoo in reaction to the impacts of PT BIA's operations (1, 4, 10). 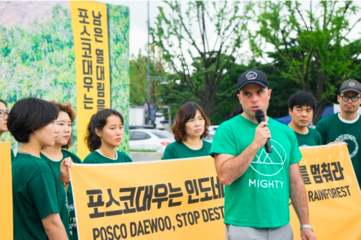 Street protests against POSCO Daewoo's destructive activities have been seen in the Korean capital Seoul, organised by Mighty Earth and the Korea Federation for Environmental Movements (KFEM) (2, 11, 12). As a response, POSCO Daewoo announced a temporary moratorium on forest clearance in Merauke in January 2018 and employed a sustainability consultant. Despite the moratorium, 10 hectares have been cleared within its concession since the beginning of the year, according to recent satellite mapping (2). Project Details POSCO Daewoo operates in Merauke through its subsidiary PT BIA, in which is has an 85% stake. 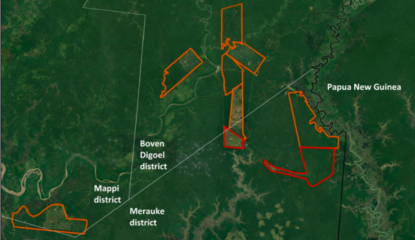 PT BIA's concession in Merauke is divided into two blocks, comprising 6,800 and 29,400 ha respectively. The company also owns a mill in the area, which was put into operation in 2017. Other Several IUCN-listed endangered species live within the concession, including a number of bird species and the tree kangaroo as well as flying possums. Development of Alternatives LMA demands the national government to cancel all location permits of companies in the plantation sector in Merauke Regency. AwasMIFEE! works for a revocation of the Merauke Integrated Food and Energy Estate as a whole, on the basis of it being unjust and harmful to both the local environment and communities. Mighty Earth and KFEM focus more directly on the activities of POSCO Daewoo and PT BIA, and demand a stop to its forest destruction. Why? Explain briefly. Despite the announcement of the current temporary moratorium, forest clearing within the PT BIA concession has not stopped. If the company decides to make adjustments to its way of operating remains to be seen. (1) Mighty Earth, KFEM, SKP-KAMe Merauke & PUSAKA (2016). Burning Paradise: The oil palm practices of Korindo in Papua and North Maluku. (3) Mighty Earth (n.d). 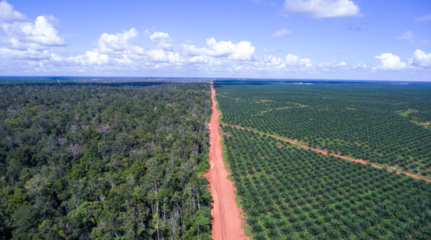 Buyers beware POSCO Daewoo's Deforestation Palm Oil Ready for International Markets – But Global Buyers are rejecting it. (4) Etikrådet (2015). Recommendation to exclude Daewoo International Corporation and POSCO from the Government Pension Fund Global. (5) Mighty Earth (2017a). This palm oil company promised destruction – and it delivered. (6) Mighty Earth (2017b). New Satellite Mapping Reveals POSCO Daewoo continues to clear Indonesian rainforest at rapid pace in second half of 2017. (8) AwasMIFEE!, (2013b). MIFEE: Recent News Reports: Company’s promise to build education facilities were lies. (11) Business Korea (2017). Malpractice in Indonesia: POSCO Daewoo's Destroying Rainforests in Indonesia. (12) Mighty Earth (2018). Activists in South Korea Rallying Against Indonesian Rainforest Destruction by Korean Conglomerate POSCO Daewoo. (10) Mongabay (2016). World's largest sovereign wealth fund just dropped 11 companies over deforestation. (9) AwasMIFEE, (2013c). Meeting with Company, Local Communities Received Compensation of IDR 1 Billion.